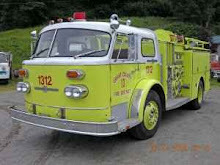 The story of my discovery and acquisition of Tacoma Fire's former Engine 17, one of the eight 1970 American LaFrance Type 900 pumpers once owned by the TFD and revered during my childhood, and its hoped-for road towards restoration. So Dad is perusing Craigslist, looking for stuff, because, you know, there's stuff out there. Lo and behold he stumbles on a listing for old fire hose, and he has contacted the offering party for more information and then lets me in on what he's up to. It is my intention to outfit Engine 17 with equipment appropriate to the period when she was new, so I ask him a little more about it. I would prefer old style cotton-jacketed hose, or at least I'd like to avoid the new plastic stuff that we use today, but seriously, can I afford to be all that picky right now? Really, I am not even looking for equipment for the most part unless - like this - it falls into my lap. Paint and mechanicals are more important to me, overall. 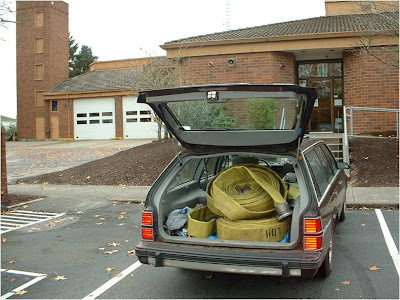 As it turns out, it is the Northshore Fire Department that is unburdening itself of old hose no longer fit for duty. It can carry water, sure, but for various reasons is no longer fit for use on the rig when lives are on the line. And what is available? Lots of 5" LDH. So, Dad picks up 400' of LDH. Does that make his Buick wagon a "Hose wagon" while he's carrying it? Yes, of course it does. So, while Engine 17 did not carry this stuff in 1970, she most certainly did by the time she was retired from Tacoma front-line duty in 1987. So, OK, I can work with that. And.... there is that word.... FREE. So, thanks NSFD and BC Jones, for the donation to old Engine 17, which is very appreciated. And I promise if for some goofy reason we actually deploy and charge a supply line at a SPAAMFA muster and one of these things lets go, it won't be your fault. If your name is still on the hose (I haven't seen it in person yet), I will be sure to remove it and protect you! And now, a new 'want' to go with this stuff: A Storz-compatible steamer intake gate. There's always something, isn't there? Dad Rocks!! Now, when I was there last week, didn't you say you needed hose bed liners?? Where does one go to even look for those? The missing hose bed needs to be fabricated, typically using oak. It is not an off-the-shelf item at all. Won't be terribly difficult to do, really, just isn't a priority right now. Or, wasn't until the LDH came into the picture. Oak or another "hard" wood is preferable. Seal it with several coats of a good quality marine spar varnish.